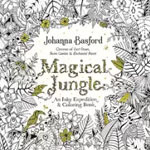 Basford’s (Lost Ocean, Secret Garden, Enchanted Forest) latest coloring book contains plants and animals found in the jungle. A tiger poses under a canopy of leaves. A tropical bird perches on an arched branch. Everything except the small insects are looking at us. A panda bear eats bamboo, and monkeys peek out from tree tops. The leaves on every page are big and small, draped with vines and surrounded by blossoms. Some of the double-page spreads are snapshots from the water (turtles and fish), and there are a few close-ups of masks and floral wreaths to color. Most of the pages have a lot of small detail and patterns, so the artist will need sharp pencil crayons or slim markers to color in the drawings. The pages are not perforated for easy removal but they are fairly thick. Markers can be tested at the back of the book on the color palette test page--a handy feature to have in a coloring book. The beginning of the book shows a variety of animals that are hidden in the book. While coloring, look for the seven frogs, 16 elephants, 20 parrots, and 63 butterflies. The gold foil on the cover adds to the appeal of this book. Those looking for a coloring book set deep in the wilderness will be happy with Magical Jungle because these drawings of nature enhance its natural beauty.